Although this is no longer possible in recent versions of Windows, the tool offers you the possibility to format disks with a capacity greater than 32 GB. 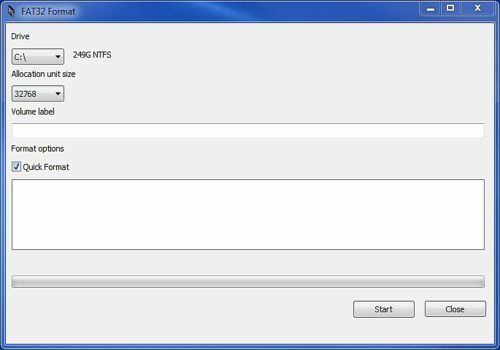 FAT32 GUI will launch automatically, without installation, and offers a fast interface for immediate formatting. Simply choose the volume you want to format, the launch is then done directly from your workstation. The interface is reminiscent of the Windows environment, which offers optimal user comfort. By allowing the formatting of large volumes, the tool allows compatibility with many devices (TV, consoles, DLNA devices and other high-tech devices). You will therefore find an effective tool that is easy to use to format your hard disks simply. XCopyEx copies, moves or deletes data taking into account the settings provided to it. It is ideal for the creation of automated maintenance scripts. Alx ChangeDate allows you to change the date when the files on your computer were last modified.